Also known as: KVM server switches, pc switch, ps/2 switch, keyboard switch, monitor switch, server switch, CPU sharer, kvm switch, PC switches, keyboard video mouse switch. 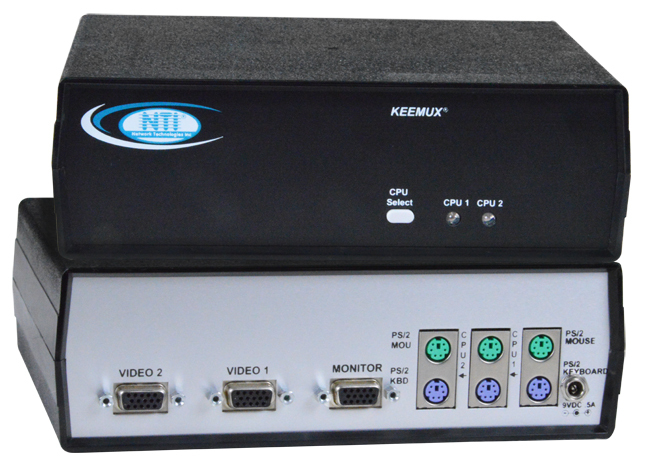 The KEEMUX® PS/2 KVM switch allows one keyboard, monitor and mouse to control multiple PCs (up to 128 computers). Dedicated internal microprocessors emulate keyboard and mouse presence to each attached PC 100% of the time so all computers boot error free. Improve manageability of your computer room – eliminate extra cables, monitors, keyboards and mice. Alps Glidepoint Touchpad – extended functions (i.e. tapping, etc.) are not supported. IBM Scroll Point mouse – extended stick functions are not supported. Touch a button and be connected to a CPU or change modes of operation. Hold in any button for more than two seconds to go into Scan Mode, Broadcast Mode or Command Mode. Normal Operating Mode, the user can directly operate the selected computer with transparent presence of the NTI switch. Scan Mode feature causes the switch to automatically and sequentially display the video from each powered on computer for 2-255 seconds. Broadcast Mode feature allows the user's keystrokes to be sent to all powered on computers. Command Mode allows the user to give instructions to the switch through their keyboard. Keystrokes are not passed to the computer. Scan Mode, Broadcast Mode or Command Modes are available from the keyboard. Use DIP switches to address up to 15 units, all of which can be daisy chained and controlled by one serial port. RS – causes switch to reset so that IN1 connects to OUT1, IN2 connects to OUT2, etc. Select computers by name with On-Screen Display (OSD). Not available on the 2-port switch. Use keyboard or mouse to operate the switch from menus superimposed onto your monitor. Type <CONTROL> + <`> to activate OSD. Control, Scan, and Broadcast functions. Search for ports by name. Search Mode lets the user type in the first few letters of the computer's name and the OSD will locate it. View names of computers on cascaded switches up to 128 ports. Modify the size and position of the On-Screen Display. OSD comes built into the switch – no need to install additional hardware or software. Advanced security included with switch. Each user password and name can be up to 15 characters long, and each switch can store up to 63 users. All PS/2 KVM switches are available in a rackmount enclosure. Add "-R" to Part # for rack mounted in a 19" (483 mm) metal case.